Foxburrow Vintage: All About the Accessories! Sometimes it's all about how you wear the accessories. What you choose for accessories can really define your outfit. One moment you're a dainty gal, and you change up a few accessories and next thing you know you're bohemian, or rockabilly! Having a wardrobe full of vintage accessories is the perfect way to change up your look in a snap. I find that vintage accessories have a lot of flair and the right handbag or bracelet can change the whole appearance of whatever I'm wearing. 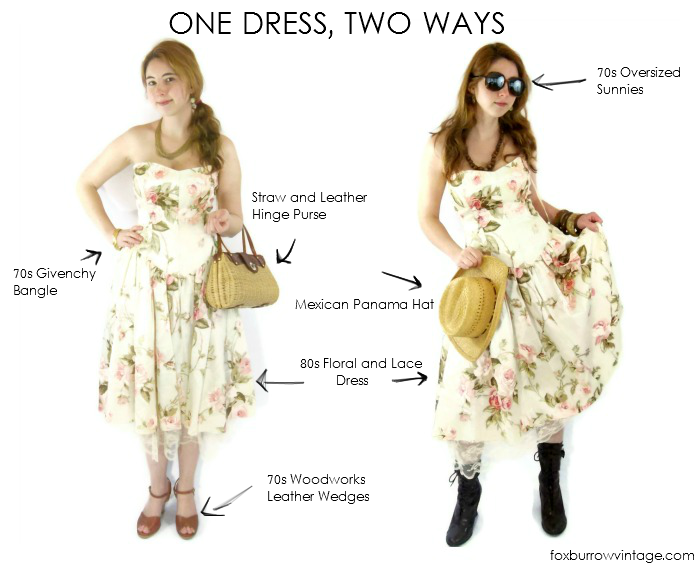 Here, I took this on-trend floral and lace dress and paired it up with different accessories to get two different looks. The look on the right is all about summer and delicate and sweet. The look on the left has a little more edge, with a music festival feel. In the first look, I paired the dress with a sweet straw and leather hinge bag, delicate gold bangle and necklace, and pretty leather wedges. The overall look is a little sweet and petite. In the second look, I wanted to go a little more rock, and a tiny bit country, so I paired the dress with a vintage mexican panama hat, a stack of wood, leather and enamel bangles, oversized 1970s sunnies, and some sweet Nine West shoes I begged my mom for in my teen-age-years (Hey, ma! Still got 'em!). Recently I've been reading some great articles from 1950s magazines about ways to re-use your same garments over and over again through the different seasons. A lot of it was all about changing necklines and adding accessories. So there you go - the idea has been around for quite a while! What's your favorite way to mix it up and change the look of an outfit? Oh, also - I've added my blog and shop to this great link-up! If you have a vintage or handmade shop or blog, you should link-up too! I am SO the right. In fact, I probably wore that entire outfit when I was in college. I would have begged for those shoes too. Nice! A little pretty, a little edge - keep rockin' it!